PackageKit - Who uses PackageKit? Fedora is a Linux-based operating system that showcases the latest in free and open source software. Fedora is always free for anyone to use, modify, and distribute. Always uses latest PackageKit version. Generally uses latest PackageKit version, but currently 0.4.7 would directly update to next release. SUSE Linux Enterprise 11 is the most interoperable platform for mission-critical computing—both physical and virtual—from the desktop to the data center. The coolest Gentoo-based Linux distribution aiming to bring the best out-of-the-box experience, providing a mix of stability and cutting-edge applications. What projects use the PackageKit system API? GNOME PackageKit is a collection of PackageKit GUI tools for use in the GNOME desktop. 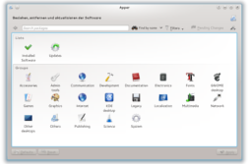 Apper is the KDE interface for PackageKit. A cross-distribution application management and software installation tool based on PackageKit. Listaller contains a PackageKit plugin which adds support for installing cross-distro packages to PackageKit. It also uses PackageKit to detect dependencies of executables and to install native packages. What software uses the PackageKit session API? The Nautilus file manager provides a simple and integrated way to manage your files and applications. The file manager lets you organize your files into folders. Nautilus also manages the desktop. The desktop lies behind all other visible items on your screen. The desktop is an active component of the way you use your computer. Uses PackageKit to install missing mime type handlers, to open unknown file formats. The purpose of system-config-printer is to configure a CUPS server (often the local machine) using the CUPS API. The tool is written in Python, using pygtk for the graphical parts and with some Python bindings (pycups) for the CUPS API. Uses PackageKit to install missing printer drivers. Zero Install is a distributed, cross-distribution installation system in which packages are identified by globally unique URIs. 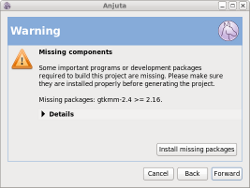 PackageKit is used to install missing packages when creating a new project.